Product prices and availability are accurate as of 2019-04-24 06:14:49 UTC and are subject to change. Any price and availability information displayed on http://www.amazon.com/ at the time of purchase will apply to the purchase of this product. 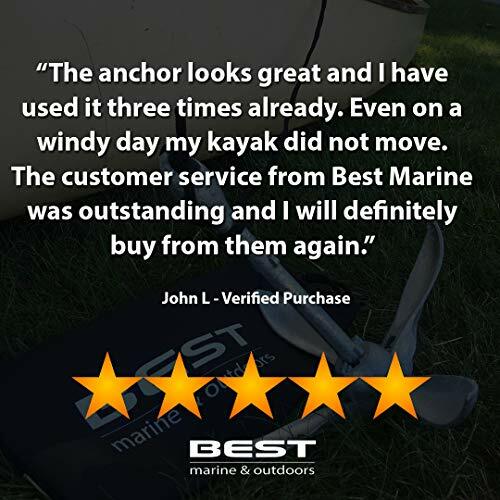 Our kayak anchor is a premium 3.5 lb folding grapnel anchor made from galvanized iron and contains a 40 foot polypropylene rope made for better horizontal drag. Our anchor is uniquely designed compared to the other small anchors on the market. First, ours is made of high quality galvanized iron. Unlike the other painted anchors that flake and eventually rust, our anchor doesn't flake and is 100% resistant to rust. 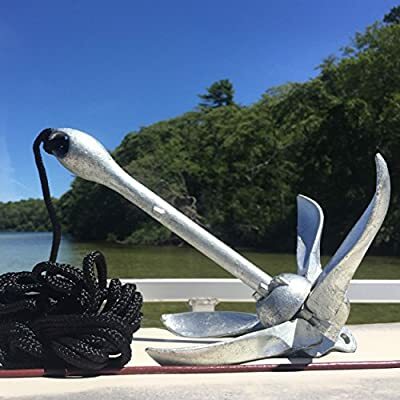 Our anchor also comes with a 40ft polypropylene rope that is designed for marine applications and is long enough to be used in most situations. Our heavy duty nylon bag protects your anchor and makes transportation and storage easy. How to use our anchor? Simply raise the sliding collar, open the 4 iron flukes, slide the collar down to the base of the anchor and twist, locking the open flukes into position. 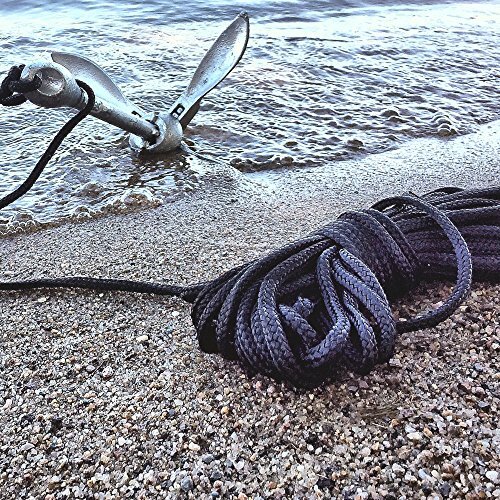 Our anchor is designed for small, light watercraft in calm water situations. It may not hold in currents, moving water or strong windy conditions. Works best in rocks or weeds. We believe in “100% Guaranteed”. It represents both our philosophy of sharing the best of times with our loyal customers and our promise to deliver a premium anker to you, your family and your friends. We pride ourselves on customer service and will do whatever it takes to make you happy. HOW WE'RE DIFFERENT - Our galvanized anchor doesn't need a painted coating to keep it resistant to rust. The anchor line is 40ft long and allows for more horizontal drag and a better hold. We also include a nylon storage bag, a buoy ball and a stainless steel carabiner for situations requiring a quick disconnect. IDEAL SIZE - Unlike mushroom anchors, our small boat anchor is only 12in x 3in when closed. It takes up minimal space and can easily be stored in Hobie kayaks, canoes, dinghy, paddle boards or Seadoo waverunner PWC. Small boats don't need large boat accessories. 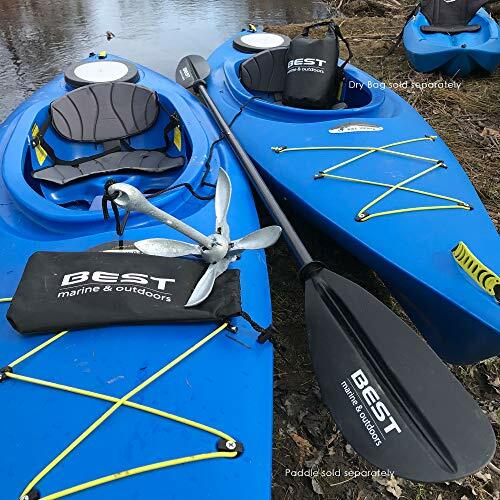 Our simple kayak and jet ski accessories are the perfect size. 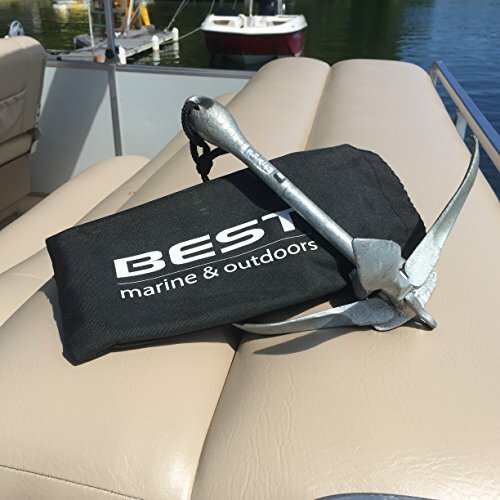 KAYAK FISHING ACCESSORIES - Our folding anchor was designed with the kayak angler in mind. Its compact size makes it easy to store, keeping it out of the way of your fishing gear. Its 4 fluke grapple design is also ideal for sandy, weedy or rocky bottoms. Don't be that fisherman drifting away fighting for position. EASY TO USE - Simply lift the grappling anchor collar, fold open the 4 flukes and slide the collar back down to lock into place. Use as much anchor rope as possible to create better horizontal drag on the bottom surface of ponds, rivers, lakes or oceans. 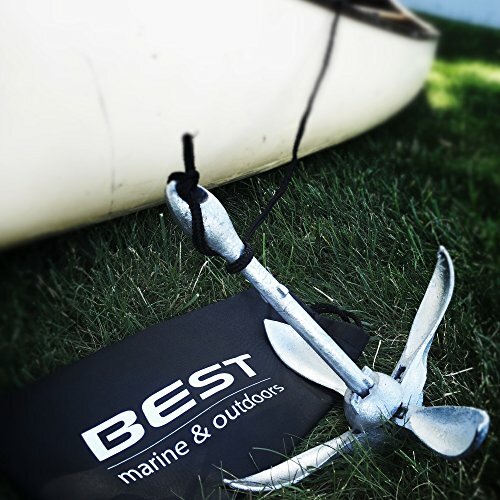 RISK FREE PURCHASE - BEST Marine & Outdoors is proudly owned and operated out of Cape Cod, MA! Our quality and customer service is second to none. If you're not satisfied with your anchor, you're protected by a 1 year, no-questions asked, money back guarantee. We take pride in our products and we're always here for our customers.